I've long been afraid to attempt to make croissants. They seem unattainable... the layers, the flakiness, the golden color... Impossible, right? I tried to make croissants once before, and they didn't turn out as I wanted them to. These, however, turned out exactly how I wanted them to. The best croissants I've ever had were at Tartine Bakery in San Francisco. They're unbelievably delicious. These croissants (not to toot my own horn) actually taste almost exactly the same as Tartine's croissants to me. I've been on a "baking high" all day. It's something I can only get from a successful attempt at a difficult and new recipe. Won't you join me in this baking high? These croissants take under 24 hours to make, which is wonderful, considering most recipes take 3 days. I adapted this recipe from Jellybean Journals. 1. Combine all of the dry dough ingredients in the bowl of a stand mixer and stir with a whisk. Add the wet ingredients. Mix with the dough hook for 3 minutes. Take the dough out and knead by hand for 30 seconds to smooth out the dough. 2. Let the dough rise in a greased bowl, covered, for 1 1/2 hours. I let mine rise in a room temperature oven. 3. Unwrap the butter and put into a quart ziplock or plastic wrap. Beat the butter until it's an 8x8" square. Put it back into the fridge until the dough is risen. 4. Watch this video 2:11-3:30. https://www.youtube.com/watch?v=2OAUM0MRgQw This is how you laminate the dough. (This means you put the butter and "turn" the dough several times). 5. Wrap tightly in plastic wrap and refrigerate overnight. 6. Divide the dough in half. Keep the second half wrapped in the fridge until you're ready to use it. Roll out half of the dough until it's 8" by 20". Cut it into 8 triangles. (You can watch the video to see how he cut his dough). I rolled each of my triangles out a little more before rolling them up. 7. Place on a silpat (or parchment)-lined cookie sheet. Repeat with the second half of the dough. Mix the egg and cream together and brush on the croissants. Let rise for 1-2 hours. 8. Bake at 375 for 25 minutes, or until desired golden color. ***Croissants can be frozen and heated up in a 350 degrees fahrenheit oven for 8 minutes. 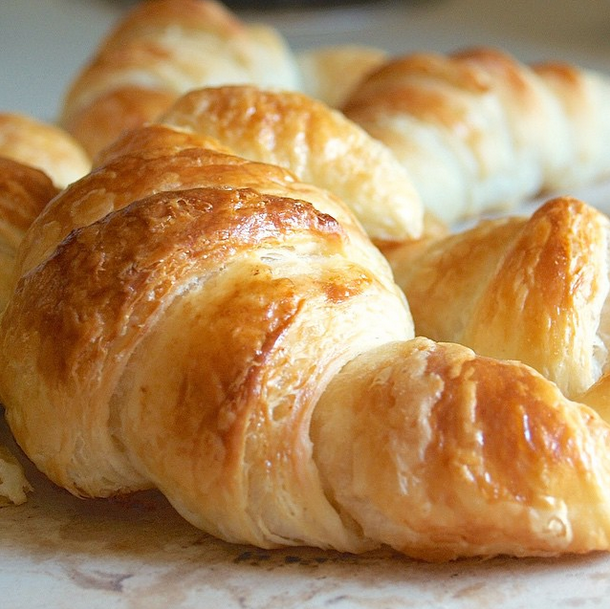 Love me some croissants, and in under 24 hours? Heck yeah! Thanks for sharing! I'm all for saving time! I have virtually no patience for recipes that super long, so these were perfect! Happy baking! Mine, too! I've eaten 6 so far... and I regret none of it! : ) Thanks for stopping by!